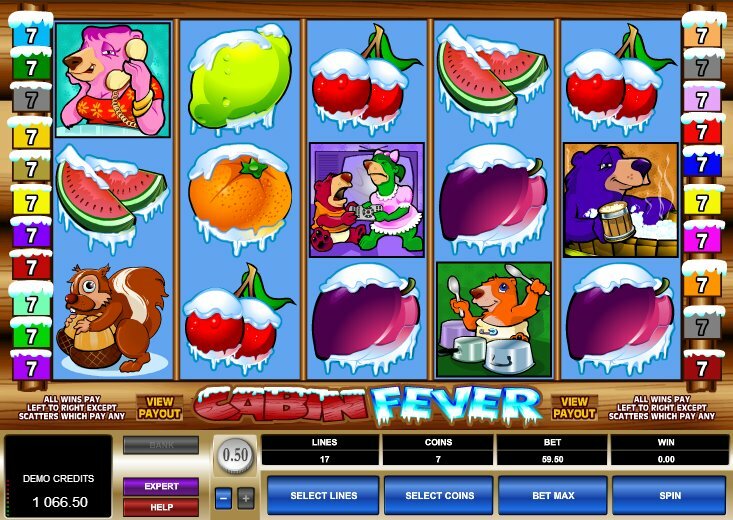 If you like your slots cheap and cheerful with no-nonsense features and simple ‘in your face’ graphics, online slot developer Microgaming’s slice of the wintry outdoors, Cabin Fever, is for you. Bonus game junkies, however, should head out into the wild. A family of bears holed up in a log cabin is the setting for this game and domestic bliss seems to be the order of the day. A baby bear plays with some makeshift drums made out of pans, Mummy Bear is on the phone, Daddy Bear ‘chillaxes’ in the Jacuzzi, and a brother and sister fight over the TV remote (presumably a choice between a Grizzly Adams film and a Bear Grylls documentary). Elsewhere, bizarrely, we have some very un-winterlike symbols, such as melon segments, oranges, plums and limes, which at least brighten up the reels, if not exactly relating to anything else featured here. Only a hungry squirrel breaks up this family get-together, and he acts as one of the game’s scatters. When 2, 3, 4 or 5 of the peckish critters appears anywhere on the reels, you’ll be awarded anything from 1 to 200 times your bet. He’s not the only scatter, though. The grumpy-looking sun, that’s obviously seen one winter too many, activates 20 free spins when appearing on Reels 1 and 5. There’s a 2x multiplier applicable here too. This is a winter wonderland and so ice and frost play a big part. The icy Wild symbol substitutes for any symbol, other than the scatters, and doubles any win. The game also consists of 5 reels and 20 pay-lines. ‘Cabin Fever’ is a term given to the feeling of claustrophobia when cooped up inside for a long time. If you feel the need to get out there and experience some more in-depth slots, such as Playtech’s wintry-themed slot, Penguin Vacation, or Pariplay’s comical take on the winter theme, Arctic Madness, probably isn’t the game for you. However, if bright colours and a healthy dose of fun do it for you, not to mention a mammoth betting range, this will stave off the cabin fever in you for a few hours.